The new Grayboe Ridgeback stock is made from a proprietary fiberglass/epoxy compound. MSRP is $599.00 with options for Rem 700/Rem Clone Short Action or Rem 700 Long Action. 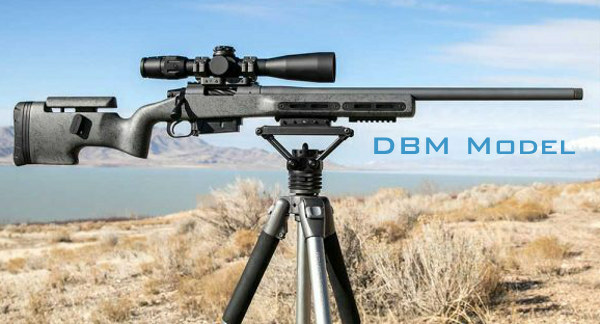 Grayboe now offers the Ridgeback stock with both DBM (Detachable Box Magazine) or BDL inlet options. We like the design of this stock. In the rear is a nice adjustable cheekpiece and the toe (underside) has a long straight run which works well in the bags. Length of Pull is adjustable with spacers. The stock is offered for both long and short Rem 700/Rem clone actions, and the DBM version fits AICS magazines. 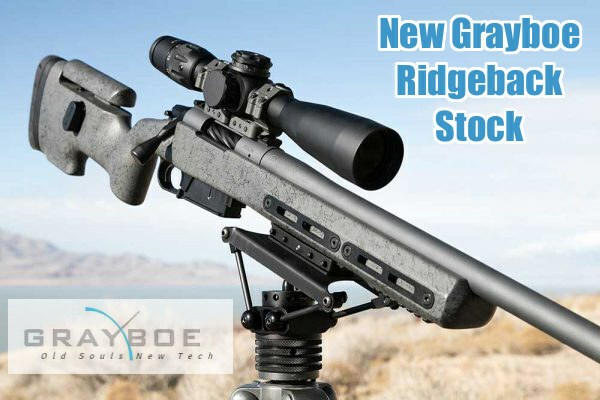 The new Ridgeback Stock is available through the Grayboe network of dealers or direct from the Grayboe website. The Grayboe Ridgeback blends qualities of traditional fiberglass stocks with modern features pioneered in chassis systems. The Ridgeback is constructed of proprietary Fiberglass / Epoxy compound formed under high pressure and heat. This creates a precise, low void, homogeneous stock that maintains dimensional stability and strength in all weather and shooting conditions. The Ridgeback features a vertical pistol grip, adjustable cheek piece, and handy M-LOK built into the fore-end. This allows easy customized placement of accessories. Finally the Ridgeback even includes a built-in bubble level — that’s clever and handy. 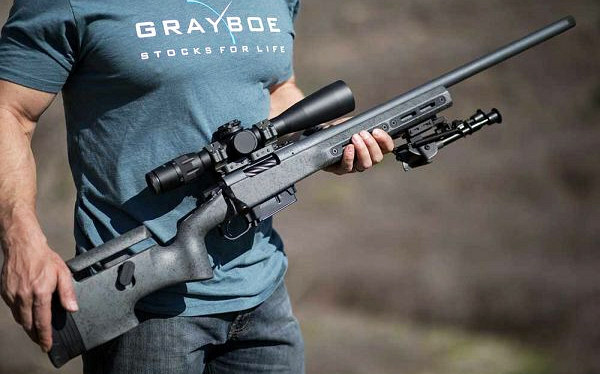 Share the post "Innovative Tactical Stock from Grayboe"
A pre-cut hole at the rear of each receiver allows easy insertion of a cleaning rod to clean the bore from the chamber. The Brownells BRN022 receiver will take all accessories/parts made for the Ruger 10/22. You can order factory bolt parts, and a premium barrel. Now you can build the ultimate 10/22 with an affordable billet railed receiver. Precision-machined from billet 6061 aluminum, the Brownells BRN-22 receiver is fully compatible with components for the Ruger 10/22 platform. Brownells offers both standard factory 10/22 top profile (with drilled-and-tapped scope mounting holes), and a Railed Receiver (shown above) with an integral Picatinny top rail. We think most buyers will get the railed version shown above. At $89.99, it’s only $10 more than the basic version. Some folks may ask — “Well why not just purchase a production Ruger 10/22 rifle from the factory? It will come complete with barrel, trigger, and stock…” The answer is the components. By starting with a bare bones receiver you can have better-than-factory components from the start — a better barrel, a premium trigger. Plus the Brownells BRN-22R Railed Model comes with a built-in Picatinny rail — that makes it easy to mount optics. And, if you want a specialty stock — say for rimfire tactical games — you can purchase an aftermarket stock that fits your requirements. Finally, the action has a port in the rear so you can insert a cleaning rod to clean from the breech end. This avoids accuracy-compromising cleaning rod damage to the muzzle. 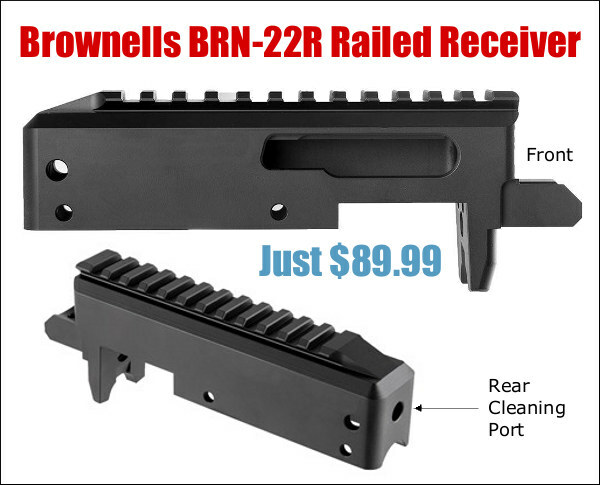 Brownells also sells BRN-22 receivers complete with pre-installed .22 LR barrels. 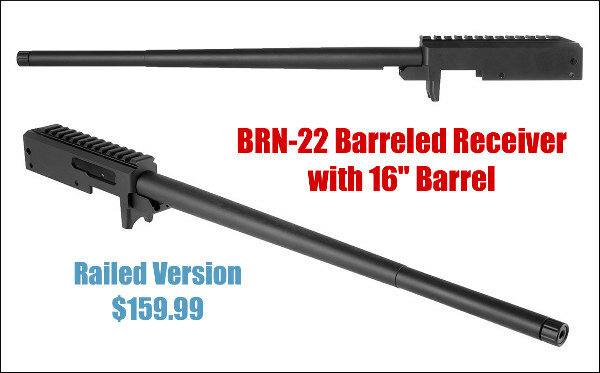 The BRN-22 Barreled Receiver features a 16″ long barrel in either sporter or heavy contours, threaded at the muzzle. Price is $149.99 standard, and $159.99 with Railed Receiver. Then you can add the remaining components — your choice of trigger, stock, sights/optic, and muzzle device. NOTE: This is NOT a complete barreled action — you will still need bolt, bolt handle, and trigger group — but all those parts can be easily acquired by direct mail-order. Like the bare BRN-22 receiver, this barreled receiver is the “gun” component for ATF purposes, so this must be shipped to your FFL. If you don’t want the rail, get the standard barreled receiver and save $10.00. Barrels are available in Sporter and Heavy profile, both in 16″ length, while the Heavy barrel is also available in a short, 10″ length for pistol or SBR builds. All barrels come with ½”-28 tpi muzzle threads for the installation of a compensator, flash suppressor, or silencer. Share the post "Build Your Own 10/22 with $90 Brownells Railed Receiver"